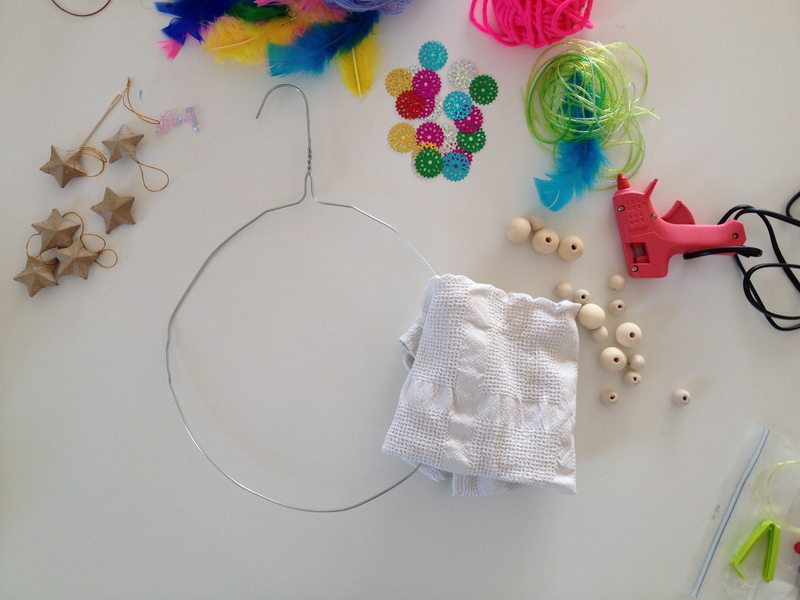 Use a tea towel to help you manipulate the wire without hurting your hands. Cut a long piece of yarn and fold it in half. 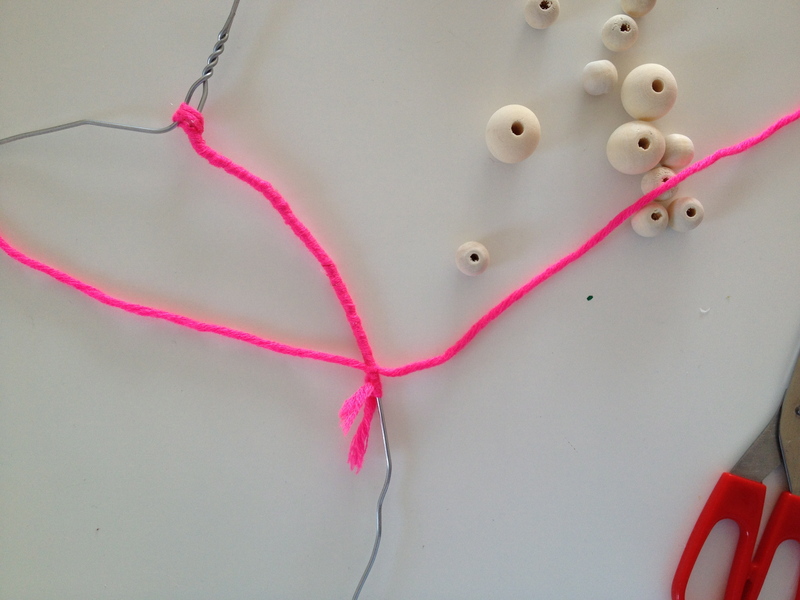 Start with a new piece of yarn and knot it just above your previous knot. 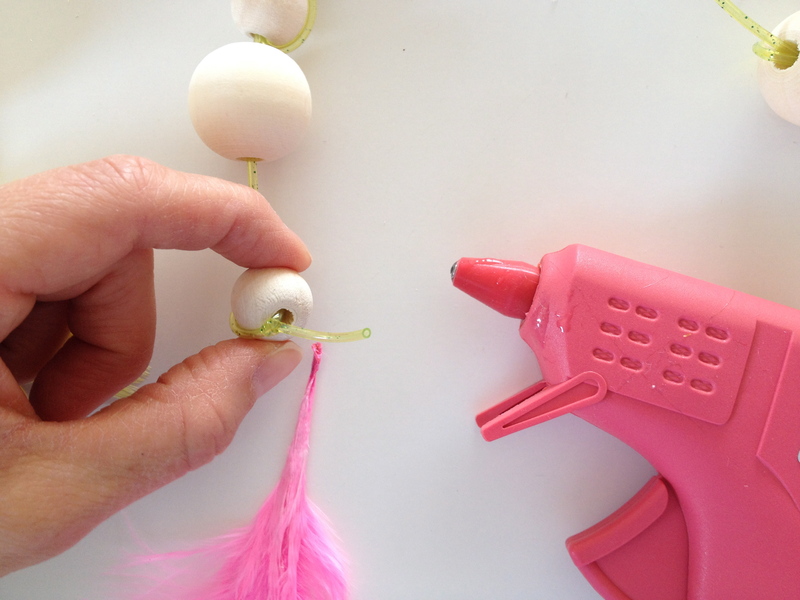 Add some hot glue before making another knot so as to hold it in place. …until you are all done. 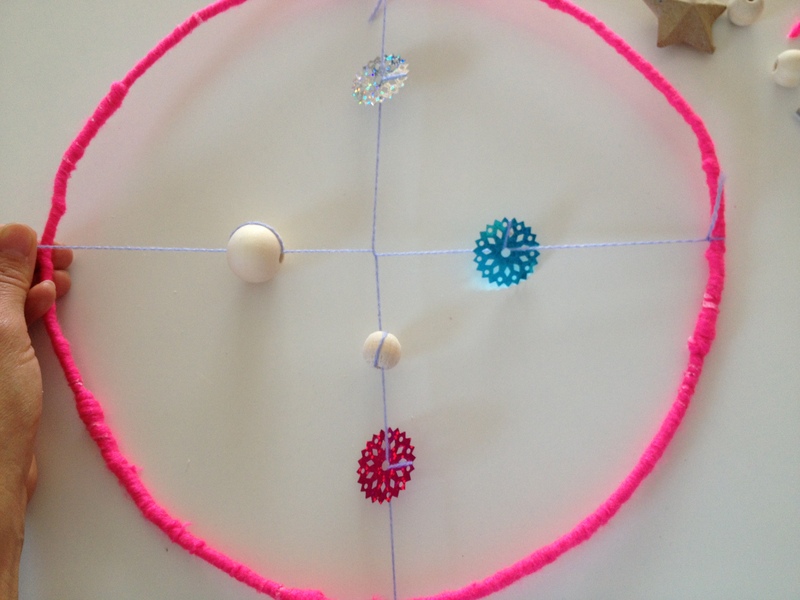 Tie the yarn to one end of your dream catcher and attach beads, buttons, etc. for decoration. 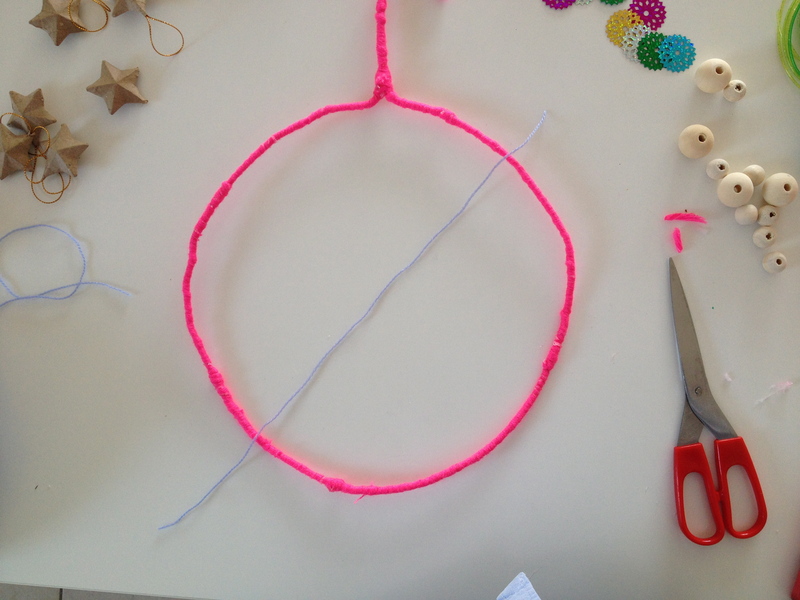 Now tie the other end of the yarn to the opposite side of your dream catcher. 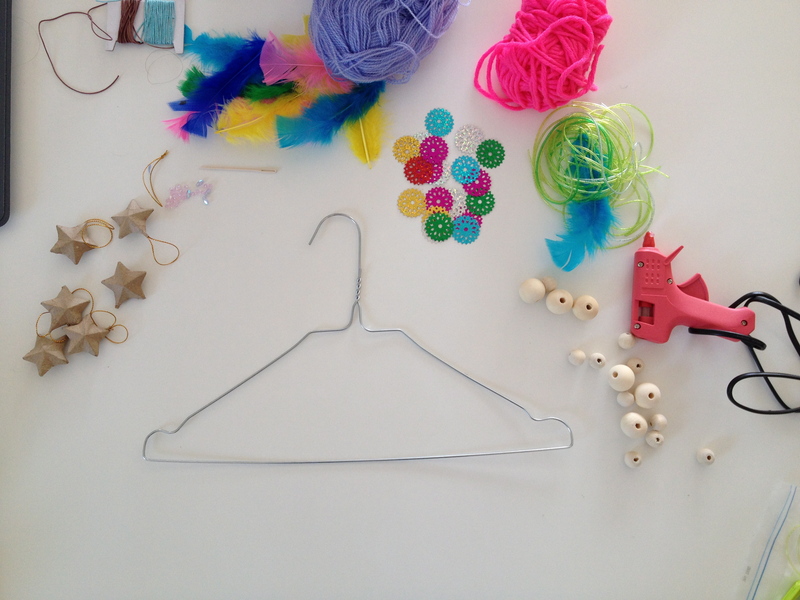 …doing this will hold your pieces of yarn in place. 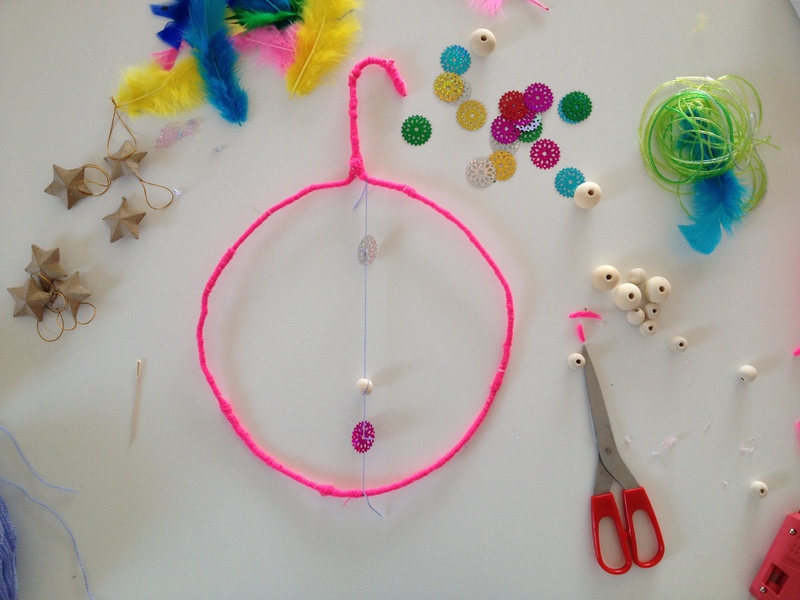 Now decorate the second half before tying it to the other side of your dream catcher. 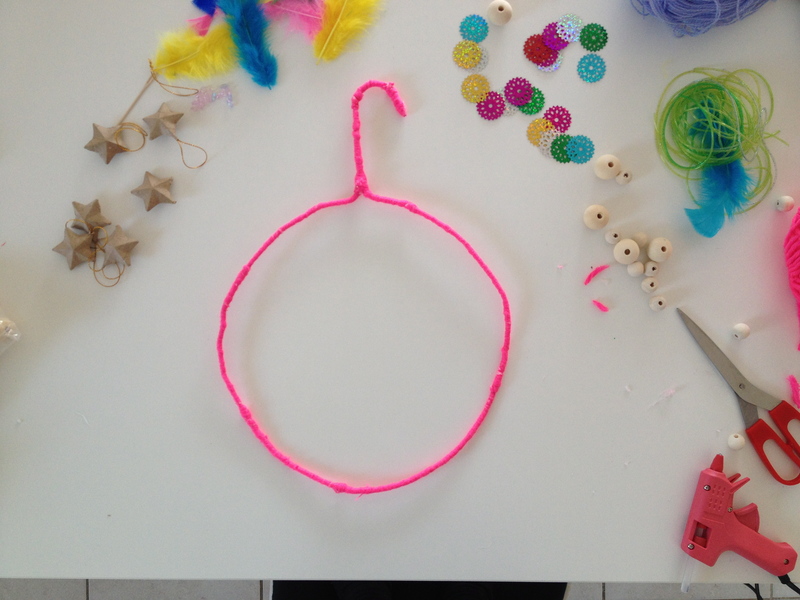 Add some pieces of yarn, ribbon etc. 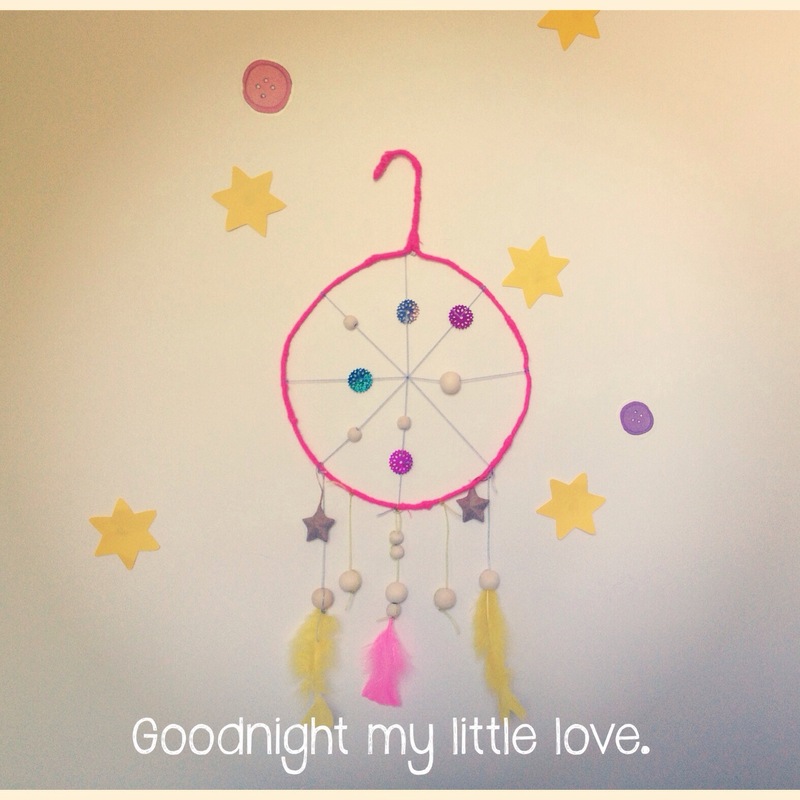 to the bottom portion of your dream catcher. 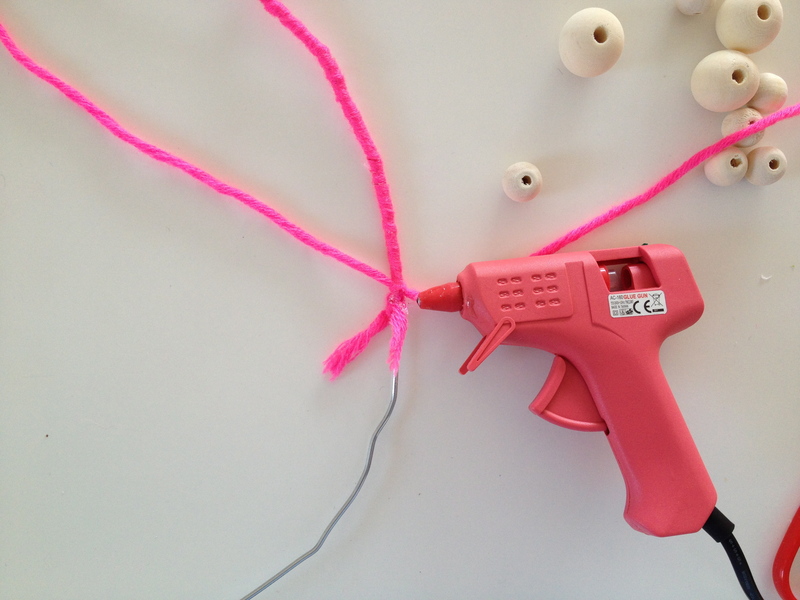 You can add some heavy beads to add some weight to your yarn. 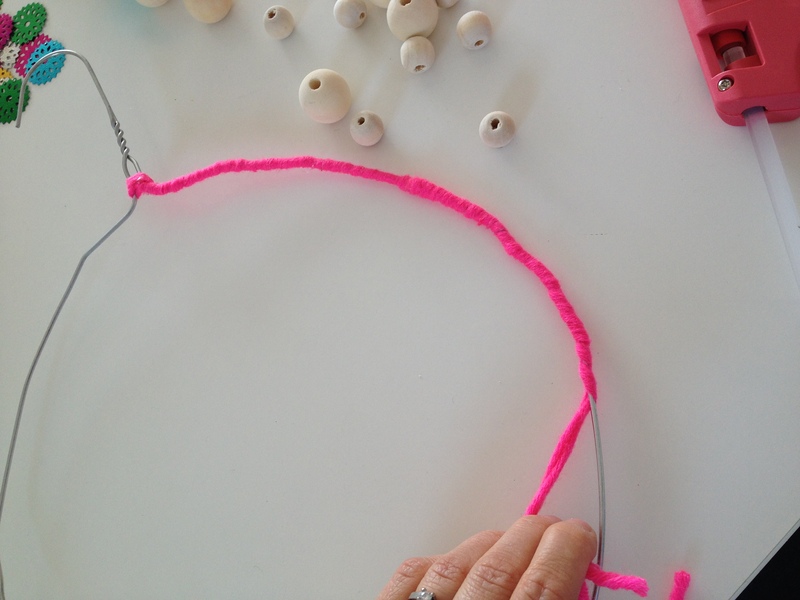 Make a knot around your beads to hold them in place. 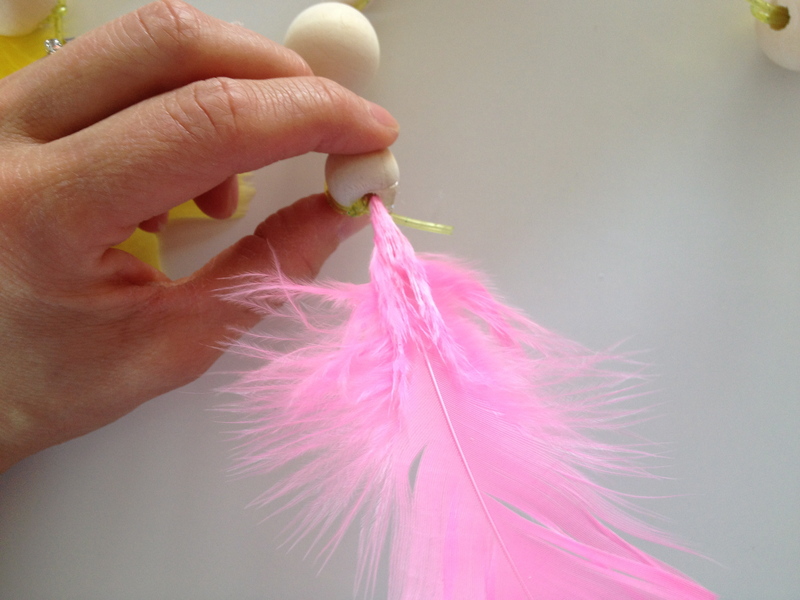 …then place your feather into your bead. Certains de mes étudiants ont travaillé à fabriquer des capteurs de rêves lors des dernières semaines et j’ai pensé que je devais partager notre projet avec vous. Avant de les faire, nous avons eu une petite discussion sur ce que les rêves sont et le genre de rêves que nous pouvons faire. J’ai expliqué que le travail d’un capteur de rêves est d’attraper tous ces mauvais rêves afin de ne faire que des beaux rêves la nuit. La semaine prochaine, je vais étendre ce projet avec des dessins et de la peinture, mais pour l’instant je suis très heureuse de la façon dont tout s’est passé. 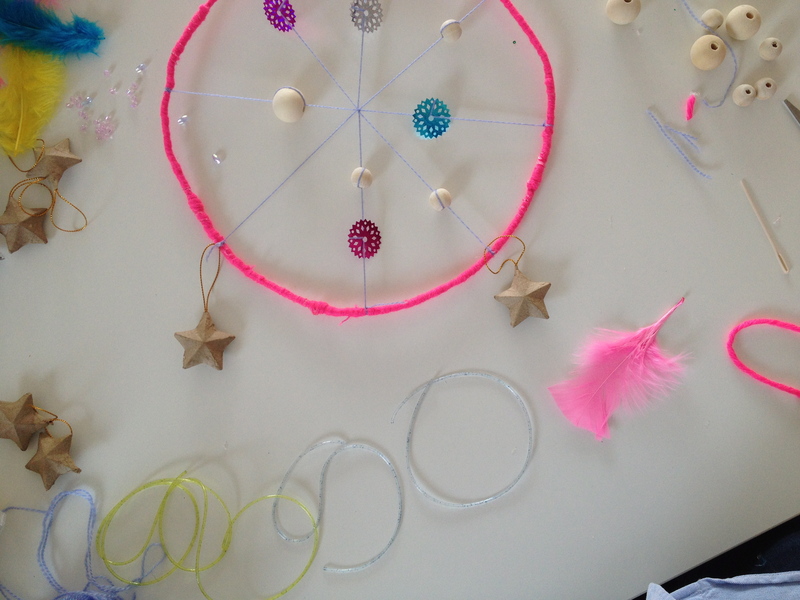 Some of my students have been working on making dream catchers for the last few weeks and I thought that I’d share our project with you. 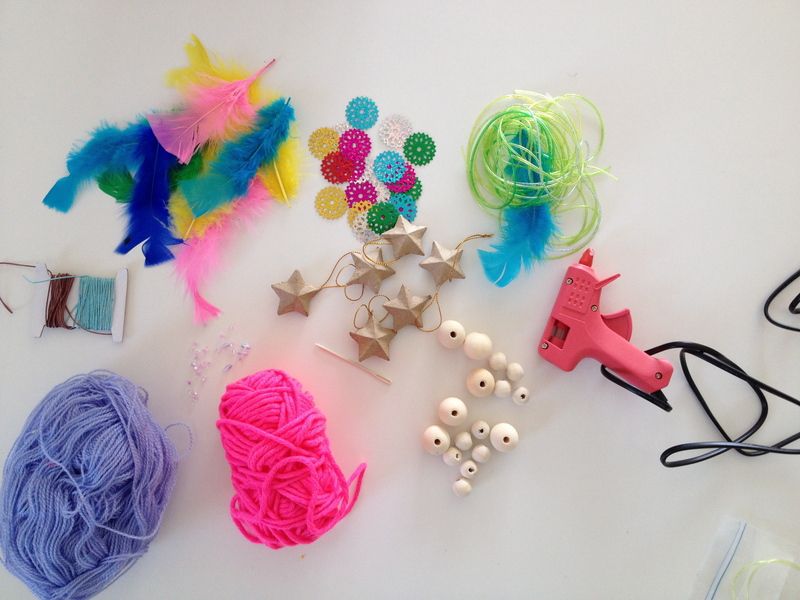 Before making them we had a little chat about what dreams are and what kind of dreams we can have. 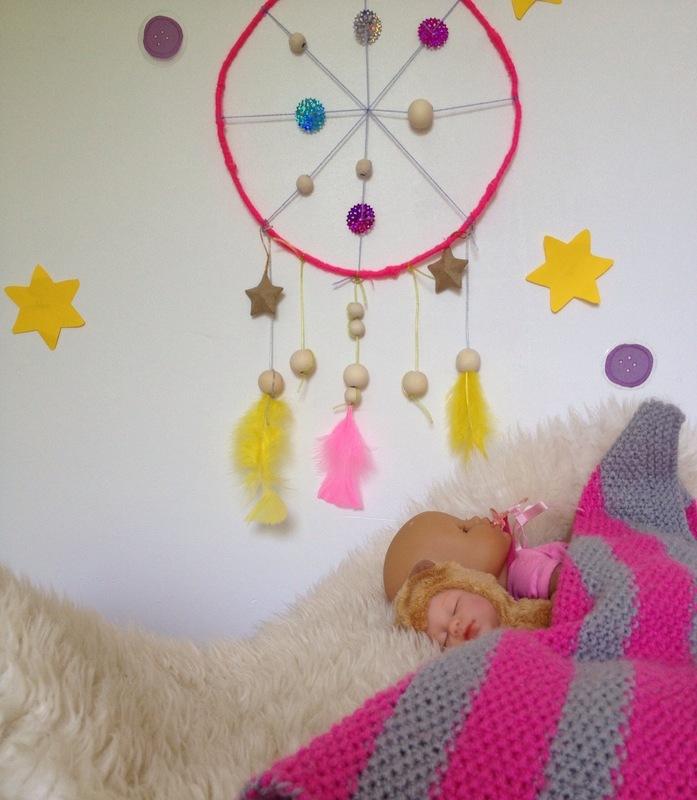 I explained that a dream catcher’s job is to catch all of those bad dreams so that we only have sweet dreams at night. Next week I’ll extend this project with some drawing and painting but for now I’m very happy with how everything turned out. 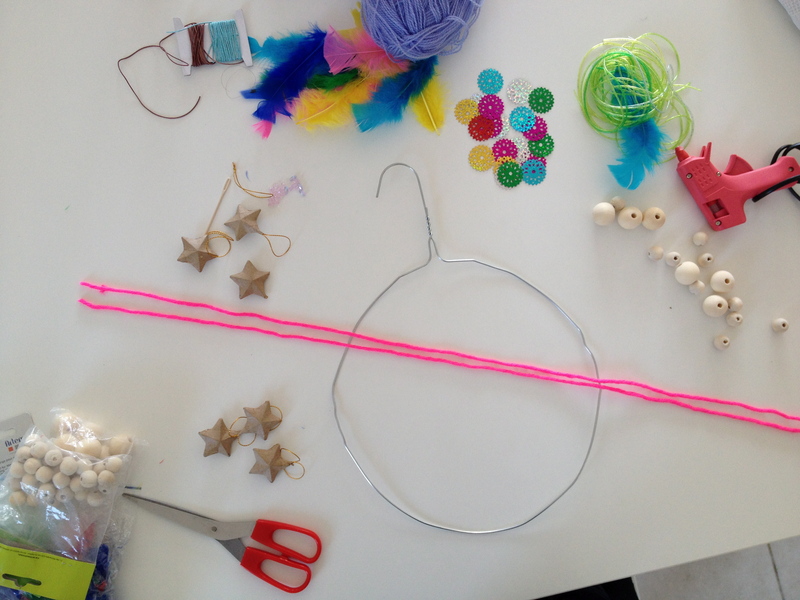 This entry was posted in Anglais, Anglais pour les petits, crafts for kids, DIY, ESL, fine motor skills, La Ciotat and tagged Activités pour les enfants, Anglais, Anglais pour les petits, apprendre l'anglais, art for kids, chante en Anglais, crafts for kids, DIY, dream catcher, dream catcher for kids, English language, ESL, foreign language, France, La Ciotat, la maternelle, Learn and Play en Anglais, learn play anglais, les enfants d'âge préscolaire, Provence. Bookmark the permalink.